Indian Navy AA Recruitment 2019: The Indian Navy had released a notification for the recruitment of 550 vacancies in Artificer Apprentice (AA) August-2019 batch. The interested candidates can check the Indian Navy Artificer Apprentice Notification 2019 PDF to know the eligibility details. Unmarried eligible candidates can register for the selection from 14th to 30th December 2018. Candidates can follow the below steps to register for the Indian Navy AA Apply Online 2019. Registered candidates can have the selection process of CBT (Computer Based Test), PET (Physical Fitness Test) & Medical Test. Applicants can check eligibility, application dates, selection & other details of Indian Navy Sailor Jobs 2019 here. Interested & eligible candidates can register for recruitment by using the simple steps mentioned below before the last date. The applicants need to be cautious with registration, if you fill any incomplete/ inaccurate data then your application rejected from the selection. Visit the official website address. 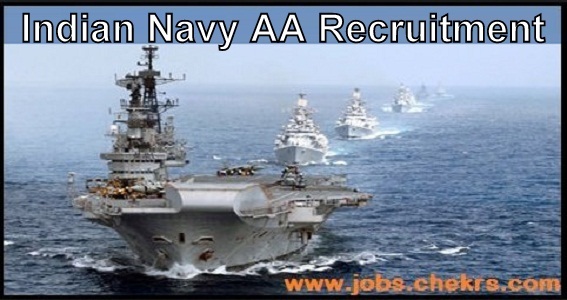 Click on the join Indian navy link. Select Careers & Jobs link. Open the Artificer Apprentice link on the Become a Sailor link. Check the eligibility & click on apply online link. Fill the application form & pay application fees. Upload the documents like signature, photograph & documents. Submit & take a copy of application form for reference.